A most presentable publication - colourful, clear and simple to use. The plasticised soft cover encourages the user to put it in rucksack or glove box confident that it won't be wrecked through a little field use. Organised with a page of colour plates and a facing page of text related to the 3-5 species photographed. The quality of the photographs is of a consistently high standard, in focus and of good exposure which aids the identification of the flora tremendously. All of the photographs are of a size that enables the enthusiast to recognise the species, which is not always the case in this type of publication. The plants are organised into seven habitat groupings which are all colour coded on the top of the text side of each double page. As explained in the introduction, many species are not confined to particular habitats and maybe found in several categories and it's good to see there is no repetition of photographs. Of the 319 species treated only 14 of these are in a section labelled 'Weeds'. A clear map beside the Table of Contents indicates all the National Parks, Nature Reserves and Flora Reserves in the study area from Newcastle to Tweed Heads. This is comprehensive and is bordered to the west by the Great Dividing Range. As an introduction to each habitat type a, brief but informed discussion outlines the conditions, underlying features and broad vegetation types prevailing in the area. The final section in the publication deals with the perennial problem of weeds: although not exhaustive it does present a selection of the more common and persistent species. The degree of invasion seems certainly related to disturbance and some species are regarded as 'naturalised' as they have become so entrenched, excluding the indigenous flora. Throughout the book botanical names take precedence over common names which avoids confusion as there can be many common names for the same species. It would be an added useful aid to have the flowering periods for each species indicated and apart from an odd spelling mistake and a superseded name this is a most useful addition to the flora of this area, which to my knowledge does not have a good pictorial cover. A timely and useful publication which will certainly be included in my travelling library. 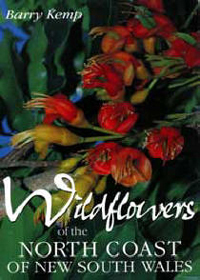 A most useful publication for land managers, bushland restoration groups, wildflower enthusiasts, students as well as visitors to the North Coast of New South Wales. From Growing Australian, the newsletter of the Victorian Region of the Australian Plants Society, March 2005.